Kate values being proactive, whether the issue at hand is day-to-day employment guidance and training or investigations and litigation. Kate’s practice is a mix of litigation and sound legal counseling. Addressing gaps in an employment manual, proactively managing leave and accommodation issues, constructing sound restrictive covenants and providing top-notch training can save businesses time, money and trouble in the future. But when litigation is necessary, Kate is an experienced and determined advocate for her clients. She focuses her practice on labor and employment law, seeking to bring clarity to clients in a field where there are often no easy answers. Working frequently with healthcare and education clients, Kate understands the hierarchy within these employment structures and the significant interactions between workers and consumers (patients, students) that present unique challenges. She is adept at hot-button labor and employment issues, such as the FMLA, the ADA, Title IX and Title VII, reductions in force, severance agreements, wage and hour matters, and restrictive covenants. A win looks different for everyone, so Kate takes the time to know her clients and their goals to protect them under the law while keeping with company culture. Approachable and practical, Kate zeroes in on the pertinent information so clients can make smart decisions and get back to the things that matter most – their businesses and employees. 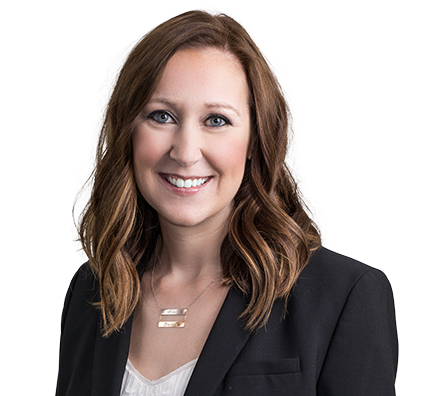 Kate won summary judgment on all claims of discrimination and retaliation filed against a large healthcare employer. Relying on a joint employer theory, the plaintiff alleged that our client discriminated against her under the Missouri Human Rights Act (MHRA) based on an alleged disability and retaliated against her for taking leave under the Family and Medical Leave Act (FMLA). The plaintiff’s husband also filed a claim for loss of consortium against our client. Strategically deciding to move for summary judgment on the underlying claims rather than the joint employer theory, Kate and the Husch Blackwell team obtained summary judgment on all claims – a complete victory for the client. Guided large not-for-profit healthcare organization through internal wage and hour audit that involved review of job descriptions and job classifications for approximately 100 positions within organization to ensure compliance with Fair Labor Standards Act. Successfully defended senior care facility against claims of failing to properly accommodate patient's deafness. Judge dismissed four of plaintiff's claims on successful motion for summary judgment; federal jury returned unanimous defense verdict on remaining six claims. Secured summary judgment on claims of tortious interference filed in Arizona state court by former employee against senior care facility and three individual supervisors. Hiring to Firing and Everything In Between: What's in Your Employee Handbook? With two little ones at home, Kate spends much of her time outside the office with her family. One of her favorite things to do is bake, which she does with the “help” of her 2-year-old son. She lets him mix his own ingredients while she follows the actual recipe, but she gives him all the credit when the brownies come out of the oven. When they get a night out alone, Kate and her husband love going to concerts. They are also honing their barbecue skills. Kate has been involved with Big Brothers Big Sisters for almost a decade. Her little sister, now a high school graduate, has been with Kate for nine years. Kate holds an undergraduate degree in elementary education, so Big Brothers Big Sisters is the perfect outlet for her to nourish her desire to help children while giving back to the community.